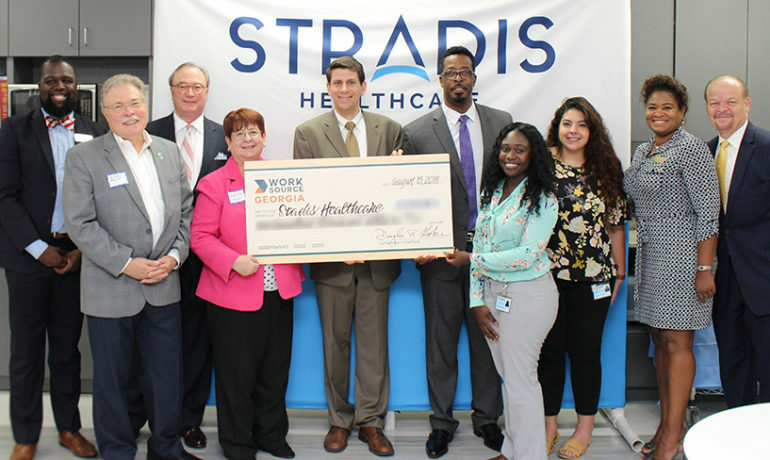 (GWINNETT- METRO ATLANTA) August 16, 2018 – Stradis Healthcare, a leader in medical device packaging and custom procedure kits, joined WorkSource Atlanta Regional and Partnership Gwinnett to celebrate Stradis Healthcare’s incumbent worker training success. WorkSource Atlanta Regional, staffed by the Atlanta Regional Commission (ARC), worked with Stradis Healthcare to provide a large reimbursement to offset a portion of the costs incurred while upgrading the skills of their entire staff. The retraining was made possible through WorkSource’s Incumbent Worker Training (IWT) program which is designed to improve the skills of employees and the competitiveness of an employer. Stradis collaborated with WorkSource Atlanta Regional to modernize and integrate several organizational processes. For an entire year, the company committed to intensive employee training that helped to improve customer experience, making the system more attractive with real-time notifications, guaranteed delivery dates and fewer stock-outs. Funded by the federal Workforce Innovation and Opportunity Act, the IWT program allows eligible employers and their training provider to develop and submit a customized training plan and application. It’s one of several programs WorkSource Atlanta Regional offers to businesses to help them remain competitive. Stradis has grown in Gwinnett for almost two decades, undergoing their most recent expansion in 2016. The company plans to invest additional funds into workforce training to continue employee development. To learn more about the Atlanta Regional Commission’s workforce efforts, please visit www.atlantaregional.org/workforce. For more information, or to learn how to get involved in local economic development efforts, please visit www.partnershipgwinnett.com. About Partnership Gwinnett Partnership Gwinnett is a public-private initiative dedicated to bringing new jobs and capital investment to Gwinnett County, Georgia. Since 2006, Partnership Gwinnett has worked with its local partners to attract and retain jobs, cultivate capital investment, support educational institutions, foster workforce development and contribute to the exceptional quality of life found in Gwinnett. Fueled by the support of over one hundred companies, municipalities, Gwinnett County, K-12 and higher education systems, the mission of Partnership Gwinnett is to strengthen the community’s diverse economy to compete in the global marketplace and position Gwinnett as the premiere place to live, work and play.